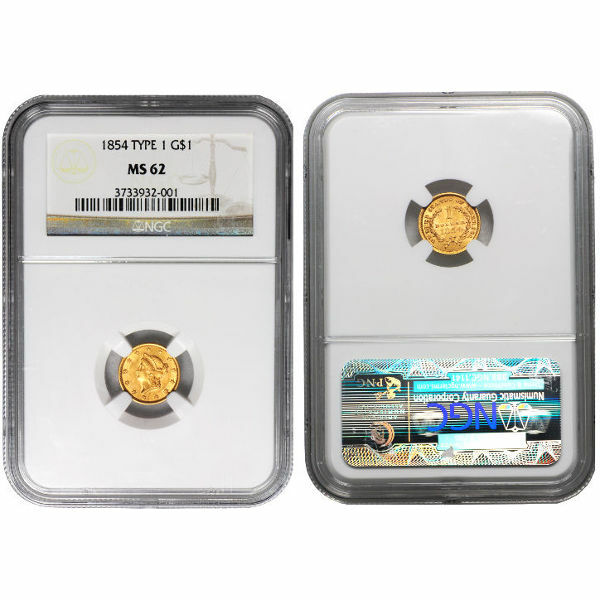 Customers; Please note that these coins will be certified by the PCGS OR NGC to be in MS62 condition. Coins will be from years of our choice, all of which will range from 1849 to 1854. The US Gold Dollar enjoyed a 40 year mintage period from 1849-1889. However, due to multiple revisions in the coin’s design, the United States Mint released three different versions of the $1 Gold Coin: the original, the 1849 version and the 1854 version. The Liberty Gold Dollar Coins included in this particular collection are the original or type I versions that circulated between 1849 and 1854. Each Liberty dollar coin has been minted from .048375 oz of gold and has been designated as an MS62 grade by either the NGC (Numismatic Guaranty Corporation) or the PCGS (Professional Coin Grading Service). Despite evident signs of wear by small contact marks, MS62 graded coins are considered to be in acceptable condition. 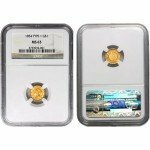 As a protective measure, all coins are kept individually sealed in their NGC or PCGS certified cases. Depicted on the obverse of every type I Liberty dollar coin is the original “Coronet” design created by James B. Longacre. The Coronet design, which mimics the the portraits found on ancient Greco-Roman currency, features the profile of Lady Liberty. In her hair, she wears a crown inscribed with her name. Surrounding her along the edge of the coin, is a border of thirteen stars in honor of the original thirteen colonies. For the reverse side of the coin, Longacre turns to rural America for inspiration. His design displays an open agricultural wreath as a tribute to the hardworking farmers of this country. Inside the wreath is an inscription displaying the coin’s denomination. Also inscribed on the reverse side is our country’s name, which serves as an arched heading above the wreath. The Type 1 Liberty Gold Dollar Coin is a historical piece of American history that is certain to become a popular favorite among both collectors and investors. If you would like to learn more about this specific coin, please give us a call at 888-989-7223. You can also reach our supportive staff through live chat or email.